AMTECH™ Offers Cast Ductile Iron and Cast Carbon Steels and Stainless Steel- FEP/PFA Lined Butterfly Valve sizes from 2" to 24" which are very high in satisfactory Performance. Tight Shut Off, Bi-directional, Wafer or Lug Style, Slim Seal, Integral Stem & Centric Disc Design, Lever / Gear/Pneumatic/Electric Operated which are suitable for chemical corrosion & temperature resistance. All our valves widely exported to Europe/Asia/gulf/American countries. Butterfly valves upper and lower valve body are assembled together With bolts and seat ring incorporated .Valve Disc and wetted part are PTFE -(PFA/FEP) Lined. 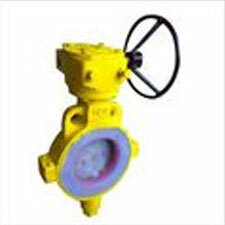 Valve suitable to mount between two flanges Flange ASME B16.5CLASS 150 RF/ DIN STANDARD/PN 10/PN 16/ PN 40 /table D/Table E/Table F etc. HYDRAULIC TESTPRESSURE AS PER SUITABLE CLASS 150#, PN 10,PN 16, PN 40 ETC.